Herman Hollerith's Type 001 Mechanical Card Punch, patented in 1901, was the first key punch; that is, the first card punch operated from a keyboard, so that the operator could punch digits 0-9, without knowing the corresponding card codes. 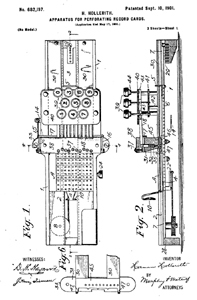 Of this device, Hollerith said "My invention ... comprises a traveling carrier for the card, a series of key-operated punches arranged at right angles to the path in which the carrier moves, so that in any position of the card either the cypher or any of the nine digits may be punched by the operation of the proper key ". Photo: Monthly Notices of the Royal Astronomical Society, Vol.92, No.7, pp.694-707 (1932). The photo  shows Herman Hollerith's Type 001 manual (non-electric) numeric key punch. The nameplate indicates it was manufactured by The Tabulating Machine Co., Hollerith's company that was to become IBM. The 1901 patent diagram  is shown at left (CLICK image to magnify). Also see Baehne  Plate 3. 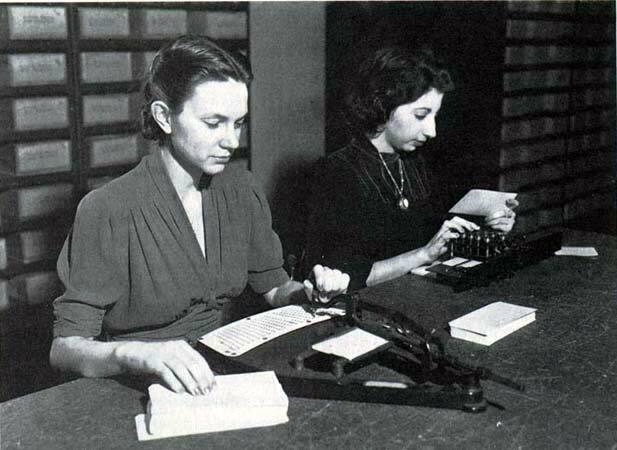 In this uncredited photo found on the Web, we see the Pantographic Card Punch and the Type 001 Key Punch side by side, in what is probably a reenactment of the 1890 and 1900 US Census recording techniques. 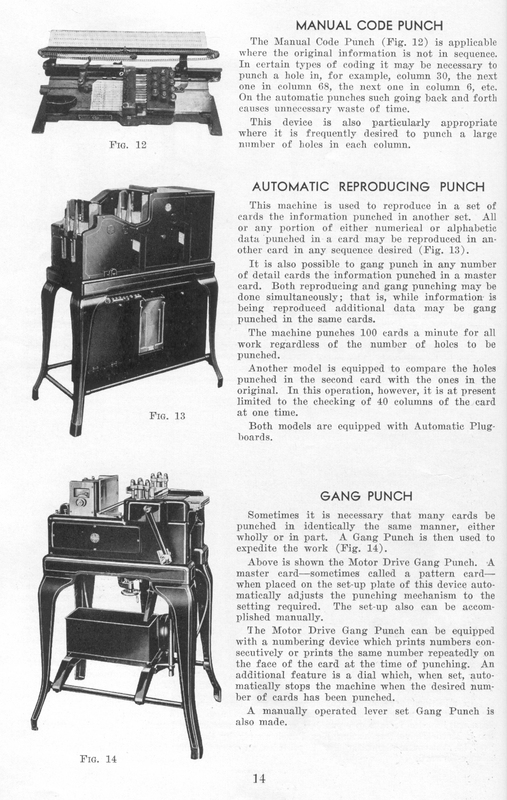 The key punch was approximately twice as fast.